Try Continuous Ink System with your Epson Expression Home XP-300 and make 30 times more quality prints for the same money! Pay only 0.04 USD for A-4 full color print! Epson XP-30 CISS allows to reduce money costs on printing several times and even more! Continuous Ink Supply System is a new technology, which provides economy during printing 20, even 30 times! 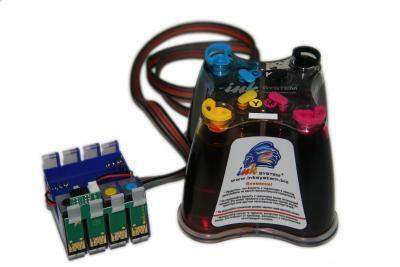 Company INKSYSTEM has been engaged in the sale of this system for printers for several years. It made a real revolution in the field of economical printing. How does the system operate? It consists of several components. These are ink tanks, connecting tube and cartridges, which are identical to the original consumables. The device prints by means of ink, which comes into the cartridges with the help of the tube. Why does buying this model if CISS mean to economize considerable means in future? Everything is very simple. 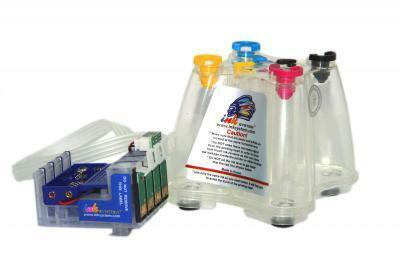 You will not need constantly to buy new tanks for ink and replace the cartridges. Everything you need is refill the reservoirs with the ink. Also you can buy CISS Epson XP-102, bulk ink system for Epson XP-30 for home and office use that allows to use one set of CISS several times! By the way, the fighters for clean environment can be delighted with this device, because the use of CISS helps to take care of the ecological situation. Imagine how many ink tanks are thrown out to the environment during the year. Using cis Epson XP-30 for printing with ink you can fill a printer without opening its cover! This printer with CISS has won the hearts of many adherents of the economical printing. If you use paper and ink of good quality, you will not notice differences in the printing quality, but you will exactly get the considerable economy. Are there any problems during the work? вЂ“ you think. It's a logical question. No, - we will reply. Continuous Ink Supply System functions are as stably and safely as the original consumables of original materials. Order ciss ink system Epson XP-30 you can right here. In our online store you can also buy CISS Epson XP-100. You should not be afraid that CISS from INKSYSTEM Company completely is identical to the all original cartridges. They are manufactured at a large factory in South Korea with the use of the newest technologies. Acquiring ink system for Epson XP-30 means to embody all the creative fantasies without thinking about spending!